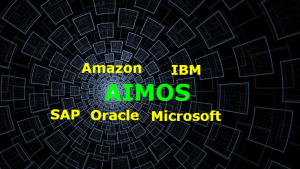 Amazon, IBM, Microsoft, Oracle and SAP (AIMOS), arguably the ‘Big 5’ in blockchain, are working together to see if they can create one huge interconnected blockchain based around the Linux Foundation’s Hyperledger. The keys include Ripple’s Interledger Protocol (ILP) and the creation of a new cryptocurrency token, the HyprTkn. The rumoured launch name for this initiative is NEMO-Blockchain (the Nemo aspect apparently enabling them to agree to combine under one marketing name). To Enterprise Times this is an unexpected development. It has the potential to unify permissioned and non-permissioned blockchain implementations, with interworking enabled in ways that have thus far defied implementation – whether at a technological or business level. As described below it could also rearrange much of conventional accounting as well as the FX market. One of the challenges of distributed ledgers is coordinating between them. For example, consider how enterprise accounting works. Enterprise A has keeps one set of books (accounts) which are audited by an authorised professional auditor (in the international environment, most likely one of Deloitte, EY (Ernst & Young), KPMG and PricewaterhouseCoopers). The same applies to Enterprise B. When Enterprise A sells something to Enterprise B it makes, in simple terms, two double entries – one recording the sale and the debt and the second receipt the payment into the bank account along with cancellation of the debt. Enterprise B performs the converse. This is cumbersome, despite the best efforts of the likes of SAP, Oracle/Netsuite and the many other vendors with ERP suites. By replacing conventional ledger technology with entries in the NEMO-Blockchain, it is possible to eliminate much of the inherent duplication which exists today. This is attraction one, for enterprises. But, as with the need for at least the big four auditors, AIMOS identified that enterprises will be reluctant to place all their ledger eggs on one blockchain. By adopting Ripple’s InterLedger Protocol, different ledgers can interwork in a way which all participants can trust. As Ripple’s ILP White paper puts it, this “enables secure transfers between ledgers and allows anyone with accounts on two ledgers to create a connection between them. Ledger-provided escrow removes the need to trust these connectors. Connections can be composed to enable payments between any ledgers, creating a global graph of liquidity or Interledger. As Enterprise Times has reported on numerous occasions, cryptocurrencies, and their ICO cousins, do not enjoy a positive reputation (q.v. the BIS, New York’s Attorney General, etc.). In this context, for the AIMOS group to decide to establish HyprTkn is a surprise. It is only when one digs deeper that the scale of the AIMOS ambitions becomes apparent. In essence they wish to supplant large swathes of the western world’s foreign currency (FX) markets and will compete with JP Morgan’s JPM Coin. If all customers of NEMO-Blockchain trade between each other in HyprTkns, then dependency on floating rate US$, Sterling, Euros, the Yen and Swiss Franc will rapidly diminish. the AIMOS group (they will eclipse, in some sense, the constraints of fiat currencies imposed by the Federal Reserve, the Bank of England, the ECB, the Bank of Japan and the Swiss National Bank). In a world where the ability to insulate from uncontrollable external factors (Brexit, the annexation of Crimea, fires, floods and earthquakes to name but a few) has greater and greater economic significance, AIMOS envisages the creation of a safe ‘economic harbour environment’ – run by themselves. At Enterprise Times we are scratching our collective heads. The obvious flaw, besides any technological ones, involves competition and anti-trust authorities. But raising this may be encapsulate the genius of the NEMO-Blockchain concept. In one sense it (NEMO-Blockchain) transcends national authorities by establishing complete electronic ledger systems, along with a cryptocurrency which is beyond national control. If significant numbers of enterprises choose to adopt it, what could national authorities do? For Enterprise Times the picture becomes almost sinister if NEMO-Blockchain and the HyprTkn do succeed. Will national economic direction now be at the behest of either a few major nationalist governments (Brazil, China, India, Indonesia, etc – all with large populations mainly under governmental thumbs) or a self-selected oligopoly consisting of the four AIMOS members (unelected and wholly unanswerable to any electorate other than a tiny number of shareholders who are likely to be billionaires in their own right). This should alarm.